Confirmation - In our parish, high school sophomores are invited to prepare for this last initiation sacrament. 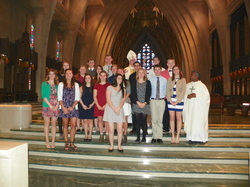 The primary parish community for young people preparing for Confirmation at Newman is the parish Youth Ministry program. Therefore, attending Youth Ministry sessions (Life Nights) is a key element in our preparation for this sacrament of initiation. As the young people will learn, part of being a disciple of Christ is having a sense of belonging together. Our Youth Ministry program is designed to provide a place for high school students to grow in that sense of belonging to the Newman community and the wider Church community. Following a regular schedule the Confirmation candidates will come together with other parish youth for social activities and lessons. They will learn what it means to be part of a parish community and will gain a better understanding of being a disciple of Christ within their everyday life. During sacramental preparation belonging to Youth Ministry is not "in addition to", but is "an essential element of" growing in faith for youth.